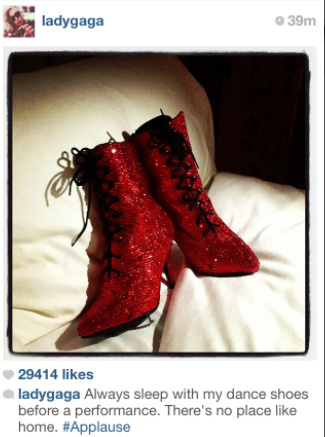 For Lady Gaga's "Wizard of Oz themed performance on Good Morning America A-Morir was commissioned to transform black dance boots into ruby red slippers. 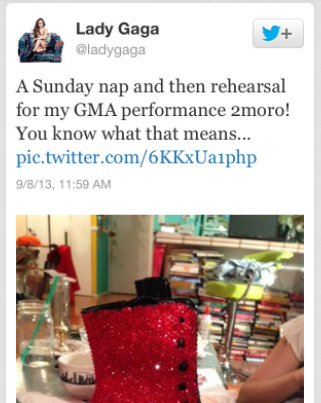 Gaga loved the boots so much she tweeted about them, Instagrammed them twice, slept with them, and wore them the night before during rehearsal. Click on all images to enlarge and don't forget to press play on the excellent GMA clip below.